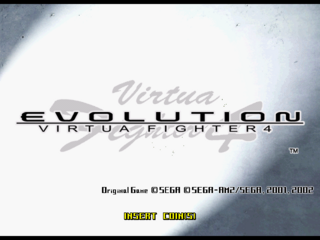 Virtua Fighter 4 Evolution (バーチャファイター４ エボリューション) is an updated version of Virtua Fighter 4, and was released for Sega NAOMI 2 arcade hardware in 2002. The NAOMI 2 release was available in both standard ROM board and GD-ROM forms. It was subsequently brought to the PlayStation 2 a year later, curiously under Sony's "Greatest Hits" range, basing its record off the earlier Virtua Fighter 4 PS2 release. The game introduces two new characters; the Judoka-assassin, Goh Hinogami and the Muay Thai boxer, Brad Burns. Various other tweaks have also taken place - for example, Vanessa Lewis's alternate Muay Thai style from Virtua Fighter 4 has been removed, and replaced with a Vale Tudo "Offensive" style, making her a solely Vale Tudo brawler. Every stage has also been adjusted, for example, Lei-Fei's stage in Virtua Fighter 4 previously took place during sunset, but in Evolution it takes place during the morning. New item store in Quest Mode. Currency system in Quest Mode. Opponent tracking log in Quest Mode: kept track of which opponents were fought in Quest Mode. Increased number of character items. Special gameplay modes (i.e. Hyper Fighter, See-Saw, Wrestler's, etc.). Emblem collecting: placed special incentive to defeat certain opponents or to avoid being defeated by certain opponents. Main article: Virtua Fighter 4 Evolution/Magazine articles.